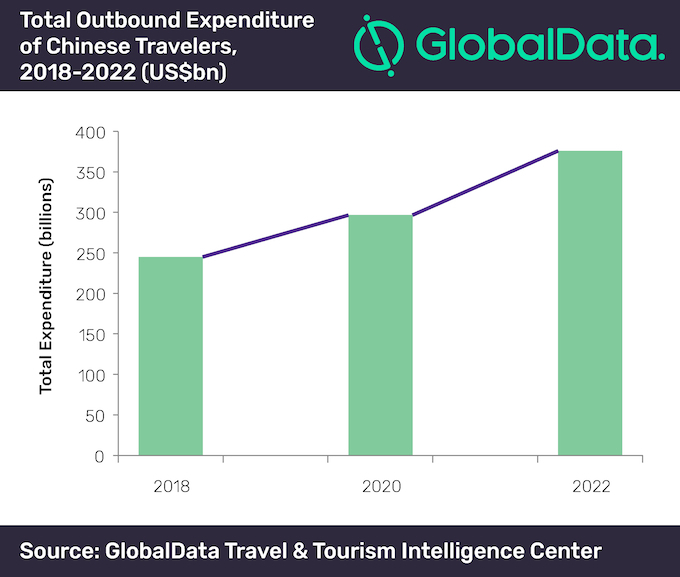 Outbound expenditure of Chinese travellers is set to increase from US$244bn in 2018 to US$375bn by 2022, at an impressive compound annual growth rate (CAGR) of 11.3% according to GlobalData, a leading data and analytics company. GlobalData’s latest report, Tourism source market: China – Analysis of tourist profiles & flows, spending patterns, current and potential destination markets and the risks and opportunities reveals that despite domestic tourism nearly tripling the expenditure for 2022, China remains the world’s largest outbound source market. Overnight stays for Chinese travellers are forecast a slowdown in growth over the next five years, and yet tourists will be venturing internationally more frequently. Outbound trips will increase due to improved air services and connectivity, visa policy adjustments and the continual development of new and upcoming destinations. Thus, outbound trips and expenditure mirror growth for the years 2018 to 2022. Despite retail still towering over, travellers are becoming more interest-driven, searching for authentic experiences, reflecting a boost in entertainment and sightseeing expenditure. “As younger generations look for forms of experiential travel, specialising in a particular form of tourism such as gastro, eco and cultural, they are willing to spend more on different types of experiences,” added Bonhill-Smith.